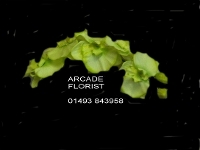 Welcome to Arcade Florist online, we are a family run florist shop with many years of experience, we offer a professional friendly service in all aspects of floristry, Our staff are here to help you decide on that special gift for that special person or to help you make your wedding day extra special and to assist you in a sympathetic way during the loss of a loved one. We offer a twice daily delivery service and accept all major credit cards. We hope you enjoy browsing Our online shop and ask if you have any questions or require any advise that you contact us on 01493 843958. For local orders to Our shop we would advise you to contact us direct as Our In Store prices can at times be more competitive than Our online store can offer. We look forward to hearing from you.